The vascular mesh is the result of the expansion of the blood vessels located in the upper layer of the epidermis. Especially frustrating when they appear on the face, as it gives a person an aesthetic inconvenience. Use cosmetics to care for the skin, contains vitamin PP, vitamin C, vitamin K and ascorbic acid. These creams strengthen vein walls and have a good vasoconstrictor effect. Select cosmetics which is mountain Arnica, Ginkgo and Japanese flowers of the wild Myrtle. Pay attention to your diet. Try not to eat too oily, spicy and heavy food. Eat more parsley, broccoli, citrus fruits, black currants, and buckwheat. Avoid foods and drinks that raise blood pressure (coffee, chocolate, etc.). Get rid of bad habits. Use folk remedies getting rid of spider veins. Take a leaf of aloe and put it in the fridge for a few days. RUB the problem area of the face with a piece of aloe. Before that, it is advisable to clean the face with infusion of tea. Repeat this procedure every day for 2-3 weeks. Or you can use fresh aloe. Squeeze some juice of this plant and rubbed into the skin, paying particular attention to the locations of the vascular nets. Take a little fresh parsley, boil it in half Cup of boiling water. After 15-20 minutes the infusion to brew. Strain it and let it cool. Then dilute it with an equal amount of milk. Extract obtained can make compresses, applying them for 30 minutes on a problem areas of the face. Typically, such a popular method helps quickly get rid of the vascular network. If the above methods do not produce the desired result, then seek help to the experts: the beautician or surgeon. Photocoagulation and laser hardening will help quite quickly and efficiently get rid of vascular spider veins, without causing the person any pain. If the affected vessels > 1 mm wide, you will need special treatment – ozone therapy, which resulted in the dilated vessels is the injection of ozone. Extremes of temperature and cold to provoke the appearance of spider veins on the face, called rosacea. Most often it appears in winter in ladies with sensitive skin. Poor blood circulation leads to the fact that a person begins to suffer from rosacea. Take care to protect their skin from extreme temperatures. In the winter, before you go out in the cold, wait 3 minutes at the entrance. There the temperature is lower than in the flat, but higher than atthe face. Allow the skin to prepare for the fact that you go in the cold. Exclude from the diet of too hot food, alcohol and cigarettes. All of these factors encourage expansion of blood vessels, and therefore, instead of disappearing, vascular asterisks will only grow in size. Eliminate the influence of ultraviolet radiation, as this may lead to the formation of new vascular asterisks. Those that are already under the influence of ultraviolet radiation increase. Use special medical tools that help to remove vascular asterisks on a face. Follow the hygiene of the face. Use all the beauty tools op care for the skin only from one manufacturer. Your main task is not only get rid of spider veins and strengthen blood vessels. 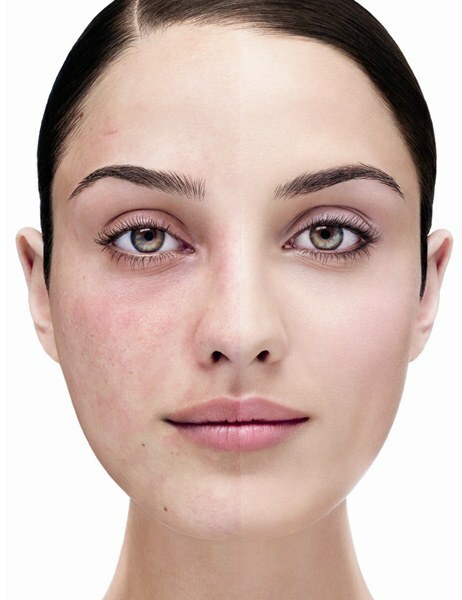 If you do not, then just a few weeks rosacea again remind about yourself. To strengthen the walls of blood vessels and reduce their fragility, eat vitamin P, which can be purchased at the pharmacy. Saturate your body with vitamin K and ascorbic acid. These two components have excellent vasoconstrictor effect. Buy only those creams that contain vitamins K, C and R. They narrow the blood vessels, and therefore, vascular mesh will gradually decrease. Do not expect that the effect will appear after a few days. In order to achieve a positive result should be about 3 months. Spider veins represent intradermal dilated blood vessels blue and red, with a diameter typically of 0.1-1.5 millimeters. Spider veins do not threaten health, but it gives women some cosmetic inconvenience.The reasons for their occurrence have not been established. It is believed to be a genetic predisposition, an imbalance of female hormones, long-term physical exertion, childbirth and pregnancy contribute to the expansion of the intradermal vessels. 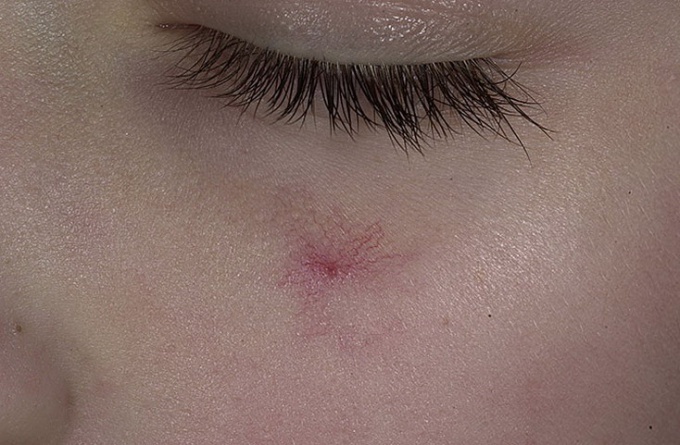 There are traditional medicines that help to get rid of vascular asterisks on a face. Take the green tomato, cut it and cut attach to the face to reddened skin. Only the tomatoes must be green, not red, as in green contains the necessary acid affecting spider veins.Compresses take approximately 2-3 minutes, and then be sure to anoint the face cream. The course of treatment is 10 days. Tear a few flowers yarrow, rosterite them until mushy state. Then the same amount, how much came out of the pulp, add the honey, cream, egg yolk and a teaspoon of fresh lemon juice. However, if you have fresh yarrow, you can buy at the drugstore dry. Then take two tablespoons and pour a glass of boiling water, then add 1 teaspoon of starch and a tablespoon of sour cream. The resulting tool will exert on the vascular star on 15 minutes. In folk medicine, also has an unusual remedy for the treatment of vascular asterisks. For this procedure you will need the Medusa, or the so-called Kombucha. Kombucha itself should be stored in a jar of water, take it only when necessary. Tear off a small piece and apply to the affected area. Do such gadgets at least once a day. The course of treatment lasts 3 months. Lubricate at night vascular asterisk piece of aloe, pre-aged in the fridge for a few days (before the procedure well clean your face with infusion of tea). After that, apply on face nourishing cream. In the beginning you may receive a slight burning sensation. However, after 2-3 treatments a burning sensation will disappear. Repeat this procedure through the day, you should have 10-12 procedures. You can use the juice of freshly cut aloe. Squeeze out the piece of aloe with 10 drops of juice and werite it into the skin. Take a handful of parsley, add a little boiling water. Steep for 20 minutes, then strain and dilute half milk. This infusion make compresses, applying them for half an hour on the face. Spider veins on the skin appear due to persistent abnormal enlargement of small blood vessels of the dermis. This phenomenon is called telangiectasia, or rosacea. Telangiectasias can be caused by different reasons: hereditary diseases of blood vessels, hormonal drugs, pregnancy and childbirth, alcohol consumption, Smoking, excess sun exposure, abuse of saunas and steam rooms, or, on the contrary, frequent hypothermia. The skin on the nose is particularly sensitive to internal and external stimuli, and therefore spider veins often appear on the wings of the nose. Try to avoid all the risk factors that can trigger the appearance of rosacea: do not smoke, avoid alcohol consumption, use protective creams from the sun and frost. Be sure to protect the nose from direct sunlight in warm seasons. Avoid hot baths, saunas and Russian steam rooms. When cleaning leather do not use spirtsoderzhaschie funds: penetrating the dermis, they cause the expansion of capillaries. For washing, use steamed bran or oatmeal to gently cleanse the skin without irritating it. Can be used for this purpose, apricot or peach oil. Soak cotton pad in warm water, squeeze lightly and store it with a little oil. Gently wipe the skin along the massage lines, changing the tampon, while the wool will remain pure. To soften the skin and eliminate skin irritation, use a mask. Grind in a blender or mince the parsley, add the gruel a tablespoon of starch or oatmeal and apply the mixture on the skin for 20-25 minutes. Boil the potatoes in their skins, clean it from skin and mash. Add a tablespoon of cream and olive oil and apply the warm mixture on the skin for 20 minutes. Perfectly are dilated capillaries mask of raspberries, strawberries and grapes. Vitamin C, which in large quantities contained in these berries strengthens the walls of blood vessels and improves blood circulation. Mask rinse with cool water and finish the procedure by applying moisturizer. Home remedies are not too effective if spider veins are pronounced and cover the entire skin surface of the nose. In these cases it is better to consult a doctor-cosmetologist. He may recommend more radical treatments, such as laser or ozone therapy. The first method is the skin treatment laser-yellow-green spectrum. The radiation penetrates the blood and is absorbed by hemoglobin, resulting in the vessel wall can be sintered. This method is quite effective however may leave scars and dark spots on the skin. Less traumatic ozone therapy in which the physician Mitroglou enters the ozone-oxygen mixture the lumen of a vessel of the skin. These procedures have contraindications, so not all are suitable. If your mother and grandmother suffer from varicose veins, you too are at risk. To prevent the development of teleangiectasia, be careful about taking hormonal drugs, including birth control. Be sure to tell your doctor about your inheritance, if he prescribes you gormonoterapii funds.